The modern growing businesses often face bigger challenges than those faced by the established and large entities. These small-sized organizations need to be more agile and productive with limited resources. Therefore a modern VOIP Phone system for small businesses that can help respond fast, boost productivity and reduce its acquisition and operational costs is the need-of-the-hour. Presenting, Matrix ETERNITY PE - VOIP system for small businesses designed specifically for small-sized businesses destined to become tomorrow's enterprise. ETERNITY PE is a versatile IP-PBX platform based on universal slots architecture, offering a variety of trunks and extensions. 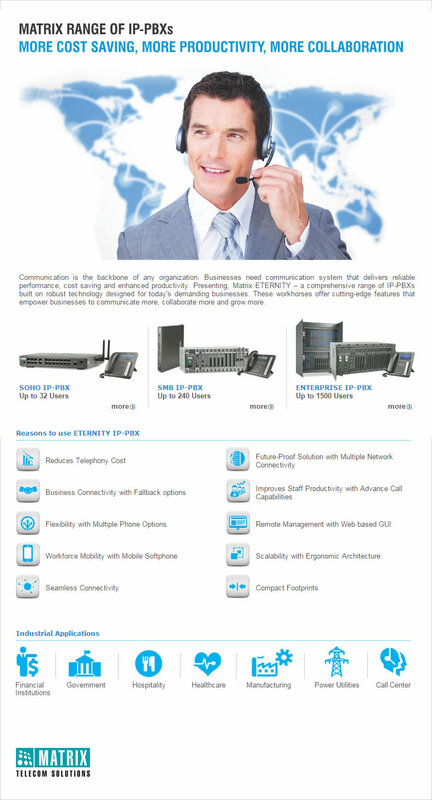 ETERNITY PE - VOIP PBX Phone system, is ideal for any small to medium business having 24 to 48 users. 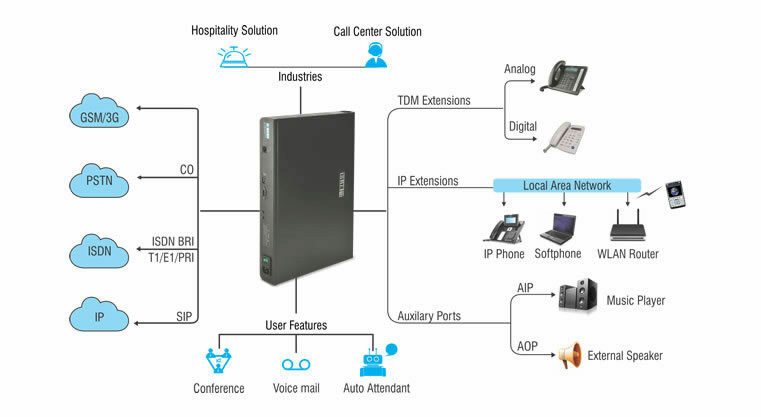 Organizations can flexibly connect FXO, GSM/3G, VOIP, ISDN BRI and T1/E1/PRI trunks and select from user extensions such as IP Phones, Digital Key Phones and Analog Phones in any combination as per communication requirements. All the expansion slots of ETERNITY PE are universal in nature. 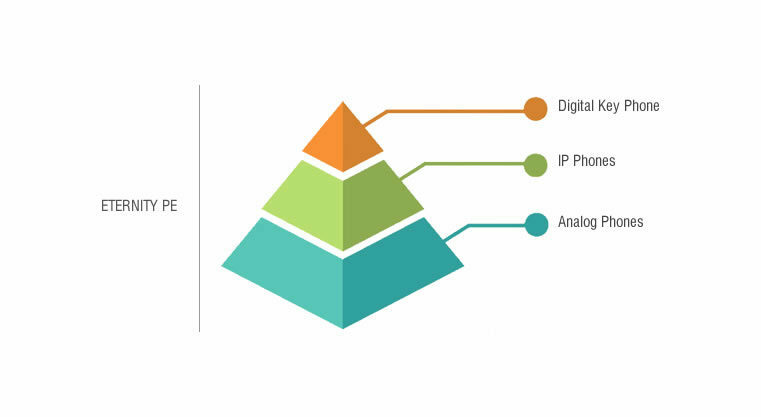 Integrate all alike or selective connectivity modules to tailor a system as per specific communication needs and diverse business applications. ETERNITY PE is a converged IP-PBX platform offering connectivity to all legacy and new generation telephony networks such as VoIP, POTS (CO), GSM/3G, T1/E1/PRI and ISDN BRI. Further, advance cost control features such as Automatic Route Selection, Call Budgeting and Gateway features ensure each outgoing call is made at minimal charges. ETERNITY PE seamlessly delivers complete access to system features on a device of user’s choice regardless of the location such as office, home or roaming in the field. Users can flexibly choose from convenient phone options. This in-turn facilitates extended user reach and flexibility to communicate from anywhere and at any time. The scalable platform of ETERNITY PE allows users to start from the exact number of trunk and extensions and extend its capacity in future. ETERNITY PE6SP is expandable up to 48 TDM users and up to 50 IP users. ETERNITY PE offers connectivity to VoIP telephony to avail benefits of low cost long distance calls, flexibility to communicate from anywhere and a host of advance call management features. ETERNITY PE supports up to four SIP accounts and 50 local or remote IP extensions. ETERNITY PE provides true mobility to its users by allowing them to use their mobile phones as office extensions. All convenience features, preferences and settings available on user’s desk phone follows on user’s Wi-Fi and Mobile extensions. Mobile users can easily transfer, hold or forward calls to office extensions, initiate conference calls and remotely access shared trunk resources from the road or customer location. ETERNITY PE offers voicemail features that increases customer responsiveness and efficient handling of customer calls round-the-clock. Voice mail in ETERNITY PE provides Multiple Auto-attendants, Option to Leave Voice Messages, Email Notification of Voice Mail and Automatic Recording of Important Calls. This ensures professional business approach and enhanced customer services. ETERNITY PE offers a host of advance hospitality features, which can perform hotel tasks such as Check-In, Check-Out, DND, Wake-Up Alarms, Reminders, Print Check-Out reports, etc. making it a complete Hotel PBX. These features are easily managed by the Front Desk Management wizard. In addition, it also supports third party PMS and CAS integration. ETERNITY PE provides integrated gateway functionality to route calls between different networks. This makes it an all integrated solution and eliminates the requirement of external gateways. ETERNITY PE easily gets installed into any office environment with various mounting options such as Table Top, Wall Mount and 19” Rack Mount. ETERNITY PE is easy to manage for day-to-day operations with local and remote programming options such as web based GUI, Analog Phone, Digital Key Phone and Mobile Phone. Based on the state-of-the-art design and modular architecture, ETERNITY PE satisfies a variety of business applications. 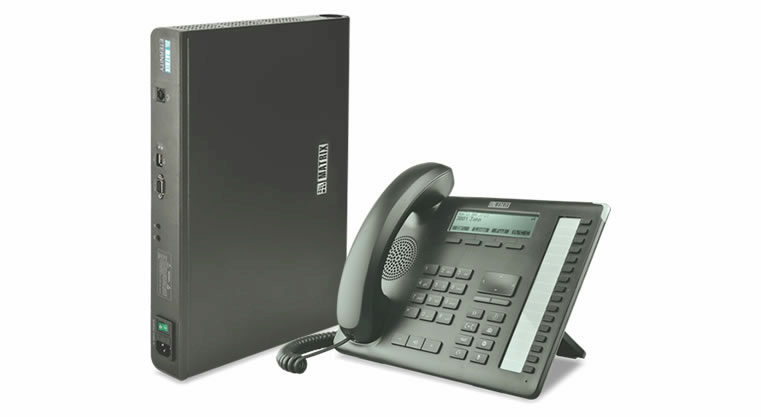 It can work as an Analog PBX, a Digital Key Phone System, an IP-PBX, GSM PBX or a Hybrid IP-PBX with all Analog, Digital, GSM and IP connectivity on a single platform. Dimensions 17.28" x 2.04" x 11.8"
© 2019 Matrix Comsec. All rights reserved. Expect More. Please submit following details. We will soon contact you to meet your needs with suitable solutions! Thank you for sharing feedback about Matrix, We will connect with you to further improve your experience with Matrix.